Columbian Mammoth. Similar in size to today’s African elephant, the mammoth could have tusks up to 14 ft long. During the Late Pleistocene Period, mammoths roamed present-day United States; and as far south as Honduras. 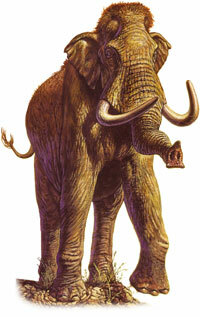 The mammoth would typically spend 16 to 18 hours a day feeding or moving toward a food source and water. Image created by Mark Hallett.